Another knitting post! As I mentioned, the past week has brought wonderful weather in the Bay Area - hitting the high 70's almost daily. And yet I continue to knit... this time with the bulkiest yarn and needles I've ever worked with. Malabrigo's super bulky yarn and size 19 needles. 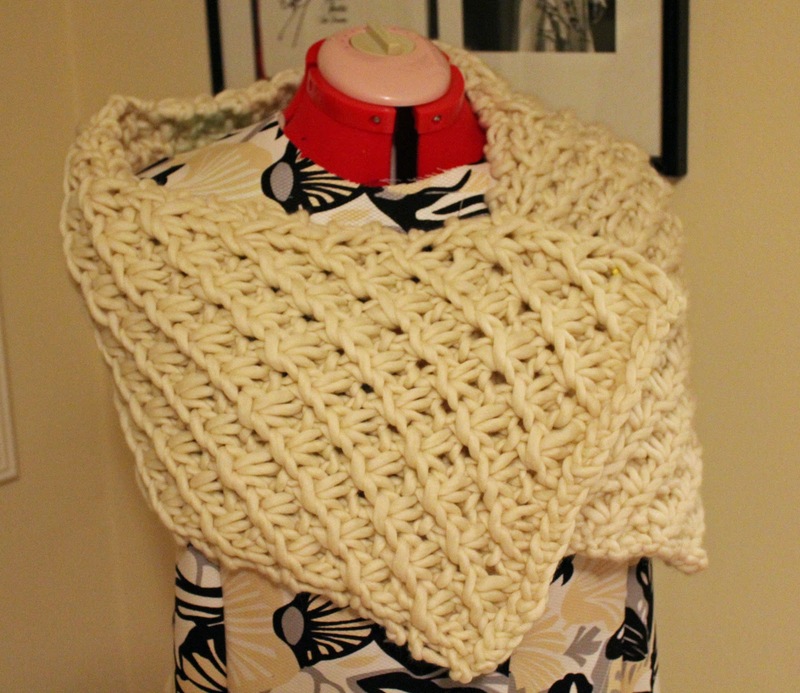 I was making Phydeaux's Asterisque Cowl from the pattern copy that I picked up at Stitches West back in February. I had intended to work on it sooner, but I had a hard time finding size 19 needles - only one yarn store in my area carried them without requiring a special order. Monster needles and uber thick yarn. My girlfriends and I had a True Blood marathon to introduce one of them to the show and to prepare for the upcoming fourth season. As I've already seen the show all the way through, it seemed like a good time to work on a fast knitting project. And fast it was! I was able to whip this up over the course of about four episodes. Before we started the show, I had to look up a tutorial on how to do the daisy knit stitch. Once I watched it through, I was set. It was really easy to do but just complicated to understand on paper. The biggest pain in this project was the combination of the bulky yarn and bulky needles. I'm looking forward to doing another one of Phydeaux's patterns, and I've already set aside some slightly less bulky yarn to knit with. The finished wrap. I just need a fancy brooch to go with it.